Through our research, we’ve found that the brain responds best to visibility. Concrete definitions remove any unnecessary variables, including the tendency to fill in the blanks. If culture is “how we do things,” then Company X was in need of some definitions for their employees to live by. But what parts of this need defining? First, let’s review the statement. Company X Culture: Building excellence through internal team collaboration resulting in a product exceeding our external customers expectation. If this is our culture, how do we define it? In the above statement, you can find three separate ideas that are in dire need of explanation. What does a culture of team collaboration look like? How do we create an amazing internal customer (employee) experience? What about the external customer (Client)? It’s easy, once aware of the need, to define a company culture. It becomes much more difficult to guide your employees mindset and behaviors in a way that aligns with this statement. Before we dive into the behaviors necessary to achieve success in a company culture, we have to define each integral part of it. After great collaboration, we finally had the executive team taking control of their company’s cultural mindset. Company X, like most of our clients, began discussing the behaviors necessary to achieve this culture completely unprovoked by our specialists. They had claimed their stake to the culture, and in the process came one step closer to harnessing the true power of their talent brand. A beautiful evolution from our first meeting. 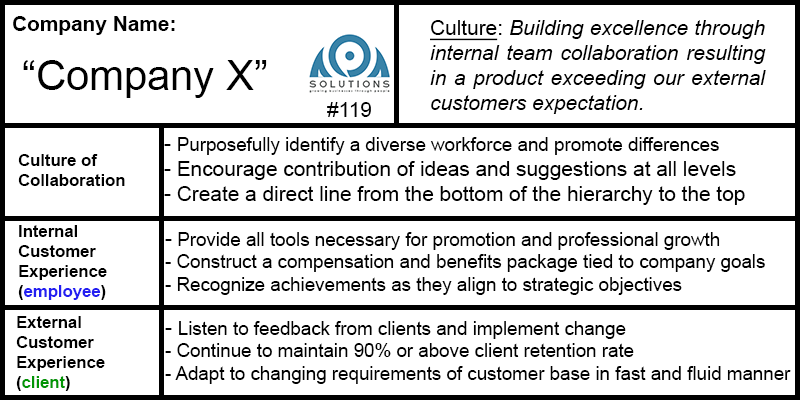 Stay tuned for our dissection of the behaviors that Company X presented as a result of these excellent company culture definitions. Don’t get left behind. So many face the overwhelming task of deciphering a job seekers mindset alone, and without proper tools. Not to mention keeping up with the ever changing employment landscape. How do you stay afloat? We’ve squeezed 10 years of research into a one day hands on program that once finished, will provide you the ability to begin executing on your strategy the next day. Click HERE to see our Superior Workforce Recruiting workshop ultimate offer!